As Jordan "leap-frogs" across the better part of western and central Canada, kids will still be in school finishing off their educational obligations. Jordan will make scheduled stops at schools along the way. Students will be treated to an unforgettably inspiring experience as they watch him land, gather for a fun talk about the record breaking flight, then be organized into a giant formation which he will photograph as he flies off. We recognize that school schedules are not as flexible as those of camps and would like to offer schools the option of omitting the presentation, so that they could still participate, without generating any extra pressure on teachers, students or staff. Friends and families of students will be able to view these photographs online with the option to purchase them as prints or within a book, the proceeds from either will go to sending underprivileged Canadian kids to camp in your province! 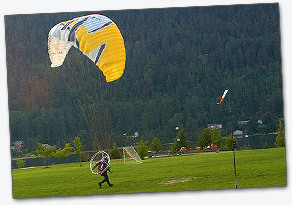 Until you have witnessed a powered paraglider launch or land firsthand, it is difficult to imagine how safe and effortless the process is. Landing: Our ground crew will arrive and clear a safe area prior to Jordan's arrival. A small engine and propeller on Jordan's back allows him to stay aloft until he is comfortable. The landing itself is quite easy and requires only a couple meters to stop. Launch: Jordan will take flight once the campers are in their formation. The takeoff resembles that of a small airplane with feet and can take as few as ten, or as many as fifty metres depending on wind speeds. 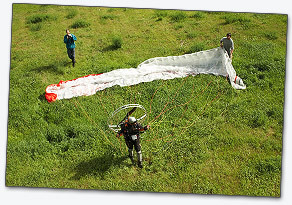 Paramotor launches are fun to watch, easy to control and simple to abort if need be. 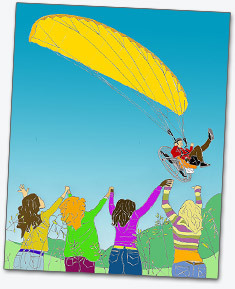 Your students will love to be a part of this great cause and epic flight. It costs absolutely nothing and takes only a few minutes to sign your school up!